OK, first and foremost – mad kudos to 17 and Baking and her must-be-awesome Dad for coming up with the coolest (well, coolest and most do-able) cake I’ve stumbled across yet! 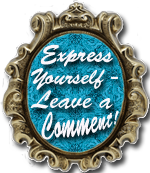 Check out her post: A Little Taste of Independence. 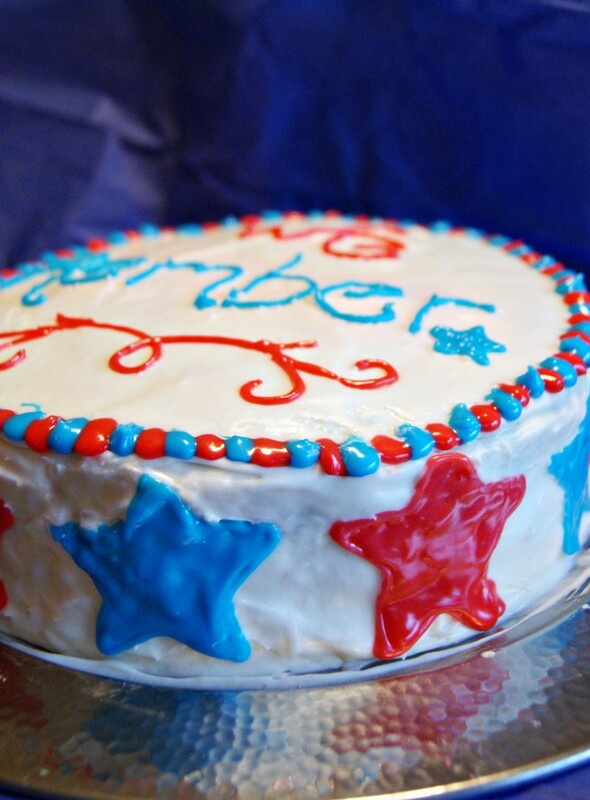 However, I was forced to submit my cake to cakewrecks.com. I’ll show you, but first let me tell you about the making of this cake. Because you should totally make one, too – it’s pretty easy and super impressive. Except the part that I screwed up. But we’ll get to that. 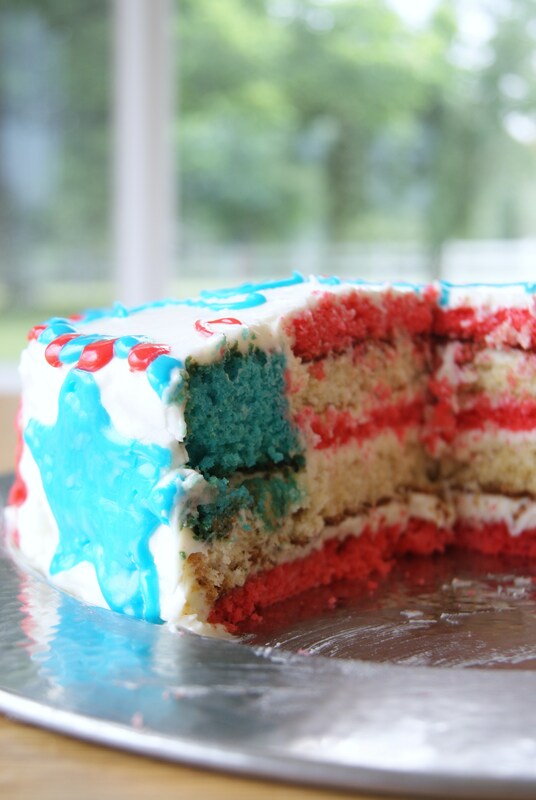 First, take another look at how cool this cake is. It’s a flag! Made of cake! IN the cake! This cake is even easier if you use a box mix, but since I’m all about perfecting my “scratch” skills these days, I picked a random recipe I found online and divided it into thirds. I divided it into thirds BEFORE mixing everything up, thereby making the process even more time-consuming, because I wanted to flavor the different sections with cola. 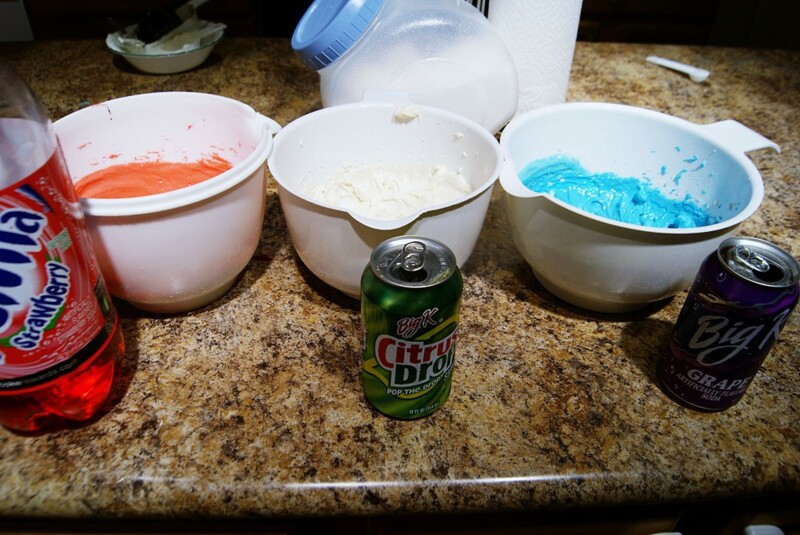 I’ve done this many times with box mixes, substituting strawberry cola for the water and it makes a really easy and yummy cake. However, there was a lot less liquid required for this recipe I chose, so you couldn’t really taste the different flavors. Ah well. I used food coloring, of course, to get the blue and the red colors. 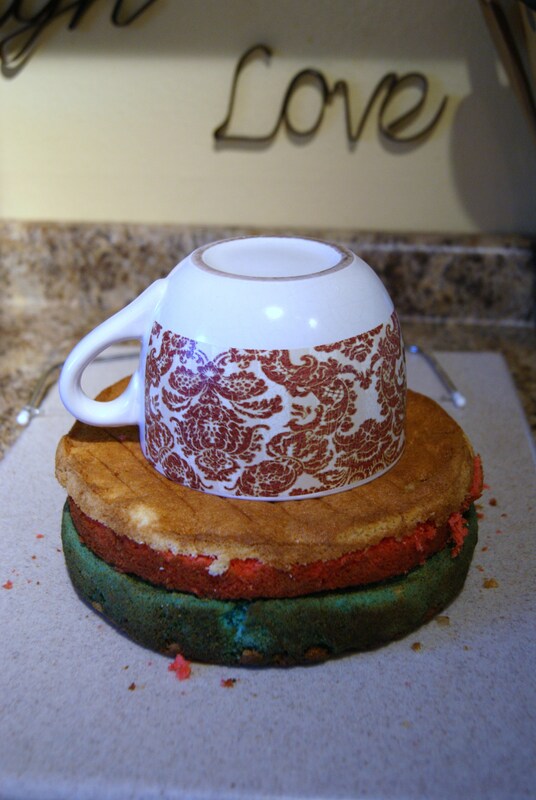 You’ll find much more detailed directions on 17 and Baking‘s site, but basically, you stack your layers, put a round object in the middle (in this case a giant mug) and cut around it. Use the inside circles of the red and white layers, and the outside circle of the blue. Genius, right??? Also, Elissa‘s cream cheese frosting recipe is fabulous. I just added a little touch of lemon juice to mine. Yum-to-the-EEEE. Now let me lead you down into pit of my shame. Wait wait wait, first let me distract you with my stars. Aren’t they pretty? I used a sugar cookie icing for the decorations because I ran out of butter, so buttercream wasn’t an option. Aren’t I an awesome improviser?? OK. Enough procrastinating already. Don’t worry if it takes you a minute to recognize the problem. David watched me decorate this cake, and he didn’t notice – we took it over to my Dad’s and served it, and NONE of us noticed. It wasn’t until the following day when I was showing the pictures to my MIL that I realized what I had done. The horror, the shame! Also… I would NOT have let that slip. No one would have noticed on that blog because no pictures were on top! You could have posted the WHOLE THING and no one would have known! Although you are turning into quite the baker… I am SOOO jealous. If I could get paid to quit and help you cook I would in a heartbeat. I bet it was yummy! oh becki d! that is hysterical! i give you an A though. the cake is amazing and you are incredibly clever. and hey, i’ve always heard that pregnancy makes women silly. so i say you’re safe with this one. i LOL’d 🙂 great!! but that cake is seriously AMAZING!!! Thank you, thank you, thank you Nina!! That IS a big compliment coming from Walt – he is a tough critic!! Hi Becki! I popped over here from your comment on my Pop Star pops on Bakerella. This cake is totally cute, typo and all. I’m a proofreader and I have to say I probably would have made the same mistake. In my mind, I saw the other “em” on the cake too. 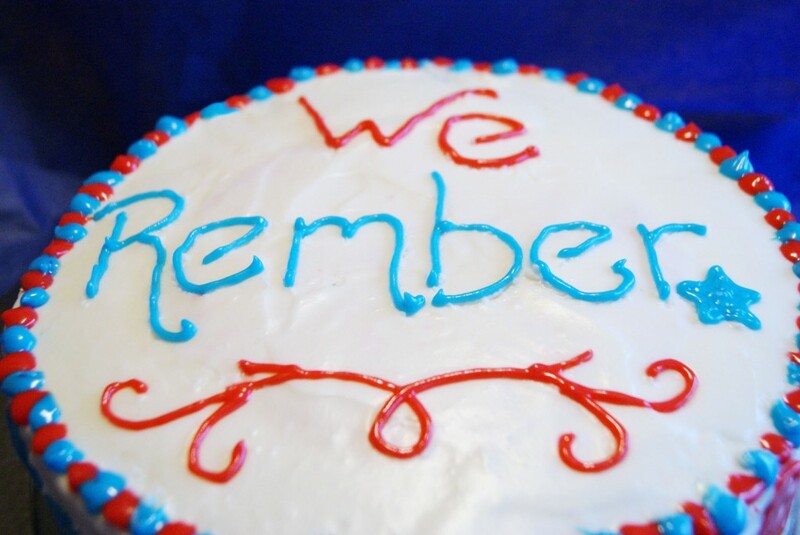 Cake Wrecks is one of my fav sites ever, next to Bakerella and Pioneer Woman. I agree, I always called it “pregnancy-induced stupidity”. It’s a very real, very insidious disease. Hang in there! And I loved your graduation pops, btw. I cheated and did red and blue balls, drizzled with the other color. Not even worth taking pictures of, but they were tasty nonetheless. Aw, I’m lame, I don’t have a blog. I just, in my daughter’s words, “creep on other blogs.” I am on Facebook, and have a couple albums of all my pops. The only ones that totally sucked, and even though I sent a pic into Bakerella, she won’t use it, were those &^#*$& sheep pops. You remember those with those sugar pearls from hell?? I couldn’t get them to stick for nothing, I’m STILL finding them in nooks and crannies in my kitchen. They were pinging all over the damn place. And my turkey pops didn’t turn out quite like I wanted. But I’m trying. I already have her Cake Pop cookbook on order, I can’t to see what she’s come up with! Ooh, skunk pops! Those would be super cute with black and white. Hmmmm. I’ll have to experiment. 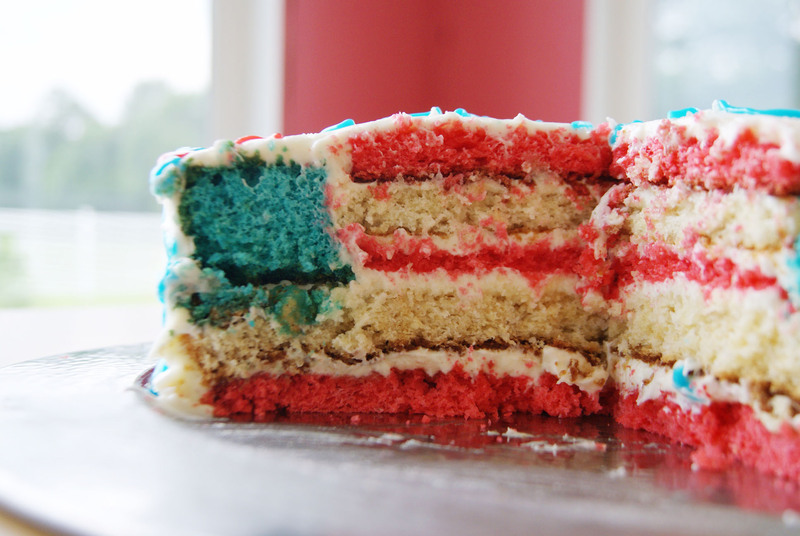 And we’re totally making this cake for 4th of July. Was it super hard? If you’re on FB, look me up: Deborah Bolig from Cincinnati. Good luck with the pregnancy! I’ve been PG a bunch of times (3x surrogate, carrying twins each time) so I kind of know about the PIS (pregnancy-induced stupidity). ha! Well, getcha a Wordpress or a Blogspot blog going! Sounds like you have lots to talk about aside from just awesome baking projects. 🙂 I couldn’t find you on Facebook, though I did find some interesting articles about your surrogacy – what an amazing gift you’ve given those couples! If you don’t wanna blog, at least set up a Flickr account so we can see your creations! Oops. I had my FB preferences for only Friends of Friends to find me. I fixed it. Now you should be able to search. But thanks! Being a surrogate has been, aside from having my own kids, the most important thing I’ve ever done with my life. My first couple’s two boys are 8, and Joan’s two sets are 7 (just yesterday!) and 5. They are adorable and they are well loved. Joan’s having a great time being a mom again, no pressure with waking up at 3 am for her job, just hanging out with her kids. She’s having a blast! OK, search again and we’ll be FB friends. I’ll look into a Flickr account, I think I had one back in the day, not sure. Next post: How Sweet It Is!